File Transfer Protocol, or FTP, allows for the uploading and/or downloading of large files. If you have been directed to the 10wire FTP site by a 10wire technician/engineer, please read the remainder of this instructional page then click the Launch FTP button below. If you have not been directed to the 10wire FTP site, please click the Cancel FTP button below. The 10wire FTP site requires a username/password in order to upload/download a file. The username/password will be different if you are uploading or downloading a file. If you do not have the username/password, please contact 10wire at 480.264.8184. By default, Internet Explorer 6 properly launches an FTP session. Once you enter the username/password, a "Windows Explorer" type interface launches allowing you to drag-and-drop your file for upload/download. 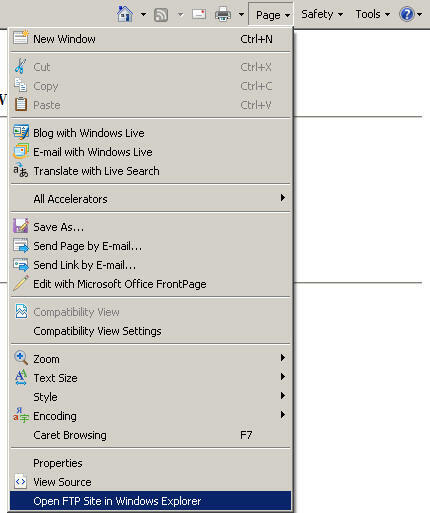 then select Open FTP Site in Windows Explorer. - You will then prompted for the username/password again. Enter both and you will have access to the FTP site.